I spent a few days in Rockford last week visiting this modest house. 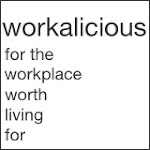 I'm going to show you what I saw, explain why I believe this house is important, why it should be important to you, and why it will be an important model for any home builder hoping to improve the performance of their work. In my last blog entry I explained where this house came from, so please by all means go back and refresh your memory. 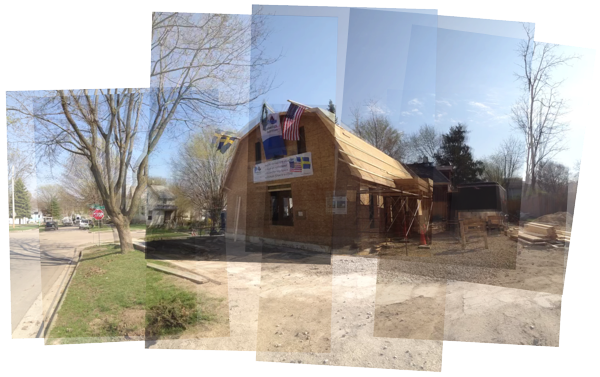 If you remember, then it suffices to repeat here that this house is being built by a team of Swedish and American high school students, as part of a cultural and economic exchange between the City of Rockford and Lidköping, Sweden. Following the detailed study of Swedish house construction my colleague Scott Hedges and I conducted, we've been focusing on building houses this way in the United States. We discovered Bensonwood in New Hampshire building off site in a way very similar to Sweden. I've published the USA New Wall and Swedish Platform Framing to promote Swedish like high performance walls made with standard American materials. I've incorporated the USA New Wall into my most recent house plans. We've been looking for opportunities to apply these technologies here, in an American House to demonstrate the techniques. So it was much to our surprise and delight when we discovered the Rockford Swedish Standard House. With a completely different agenda they were tackling the same questions we had - how do we apply these Swedish techniques here with American materials. Its affirming that they've reached many of the same solutions. I arrived in Rockford on the day the rough framing of the house was complete, so I was able to look at the final configuration of the wall framing without any obstruction and document it. The house is using what I will call a variation on the USA New Wall Best case configuration. It is a 2x6 wall with an exterior side layer of insulation turned to reduce thermal bridging, and an interior side wiring chase with an additional insulation layer also turned to reduce thermal bridging. The three layers total R35, and the reduced bridging will ensure more of that value makes it through to the averaged total value. So how is it different? The Rockford wall variation put the exterior insulation behind the sheathing, with 2x2 cross furring between the sheathing and the studs. The USA New Wall Best case locates the exterior insulation layer outside of the sheathing, and uses a continuous layer of mineral wool insulation. This is driven by construction sequence and it parallels the practice of exterior foam which is familiar to many builders. In the typical sequence of building in the US, the carpenters like to finish, and leave, and they are followed later by the insulators. The USA New Wall respects that sequence by allowing the carpenters to finish up their work, and the insulators installing exterior layers after they are done. With the Rockford wall this sequence is either broken, with sheathing going up later, or by installing this outside layer from the inside which is a little bit more difficult. 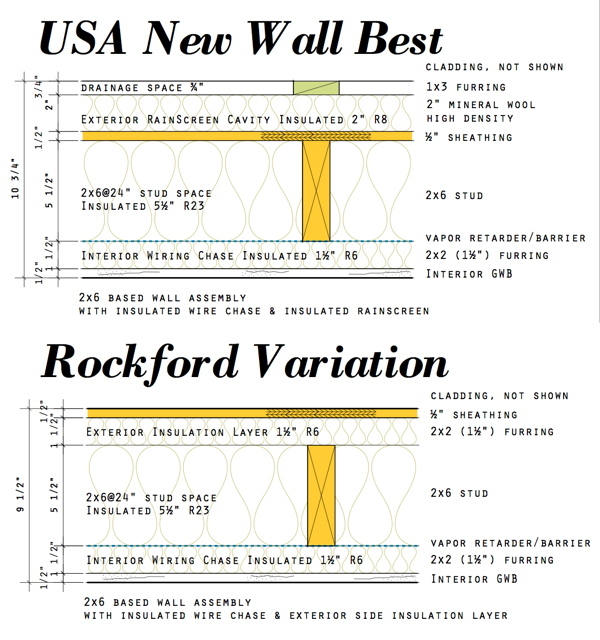 What is significant here is that the Rockford variation is a closer analogy to the Swedish wall, which would not have sheathing, but rather heavy wood siding over the exterior insulation. For the Swedish Team at Rockford this was closer to what they build at home. I think the Rockford Variation is a legitimate alternative. What it may lose in sequence or toil with the exterior insulation layer it gains in easy installation of American nail-fin mounted windows. The sheathing is the outboard layer here, and so its easy to install our windows - nothing special needs to happen. The USA New Wall Best case is less straight forward for windows. If mounted to the sheathing they require jamb and sill extensions. Or they need to be blocked out to the plane of the siding. 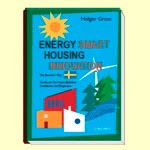 Insulation is another breakthrough for the Swedish Standard House. For the previous project, the Swedish Influence House, they had used spray foam throughout the house. In the 2x6 walls it achieved a good R-Value, but it was expensive, and as the Swedish team said - not very Swedish! But it did clearly raise the performance of the house. For the new house they were determined to use the multi layered walls as in Sweden, and so they were reluctantly looking at using our poor American fiberglass batts. Scott and I immediately put them in touch with Roxul for mineral wool. We are very happy to say that Roxul has taken on the project as a sponsor and the house will be fit out with mineral wool just as it is in Sweden. So its also a great breakthrough to see the house full insulated with mineral wool. Another breakthrough with this house is it was built on a shallow frost protected slab on grade consistent with the systems used in Sweden. We've covered this in detail in a past entry, but this is the first time we've seen the system applied to a house here. The insulation forms were custom made for the project and they cost several times more than the readily available products in Sweden. I'd say it was proof of concept, but its a well proved commodity in Sweden. None the less its good to see, and still a great breakthrough for this house. What does this mean to us? Today builders in the US don't build like this. There are a small percentage of builders trying to do something better, but almost universally they are tying their efforts to more complicated systems or more expensive building products. The consensus from status quo builders is that it costs too much and that they can't sell this to consumers, that people don't want to spend that extra amount on performance. The problem here is that they are building the wrong type of wall. Better performance is not nearly as complicated as it is made out to be. And it does not cost nearly as much as is presumed. The additional effort in building we see here could be easily off-set by energy performance and a well designed floor plan that reduced wasted space. The Rockford house points a way to this future. This isn't hard. This isn't rocket science. We can do this now, and we can do it for every house we build if we choose to. Its up to you to demand it. Tell your builder that this is the kind of wall you want, the kind of performance you demand. Show them the USA New Wall details and make them read the story. Press your lender, and their appraiser to recognize the value that better energy performance contributes, and the monthly cash-flow it makes available for funding better performance. If any of these parties resist, we are here to help you. Call on us. Photo Gallery from my visit. Great post, Greg! I am sorry that I couldn't make it down to Rockford while you were there, but I hope to soon. Since the Rockford house used OSB as an exterior sheathing (and an interior vapor barrier), do you forsee any future moisture problems due to the OSB not allowing "drying to the outside"? No. 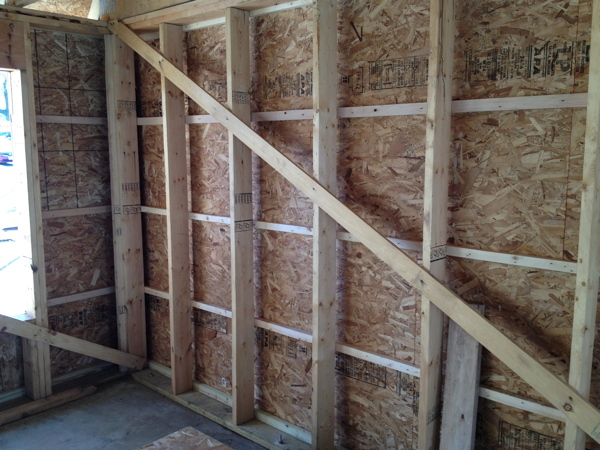 OSB does not pass vapor as readily as plywood due to the glues. But it is a vapor retarder at best and typically between 1-10 perms - which is considered semi-permeable, or a Class III vapor retarder. So it slows the transfer of vapor, certainly, but it is not as tight at the interior variable permeability vapor retarder sheet they will use. And if that sheet does get wet it will open up and promote drying to the interior. Rockford is climate Zone 5, very close to the border with 6. So humid summers that could cause condensation in the wall while the house is air-conditioned is slight. I am not sure what their plan for the exterior is, but I would bias the wall for winter performance here. What that means is I would lean towards building paper over house wrap since the air-tight barrier will be the interior vapor retarder. There is no need to use house wrap taped to be air tight. Instead the building paper along with the untaped joints of the OSB will permit the outside layers to pass vapor more readily than the perm rating of the OSB would suggest.